Little Green, the proudest, most trustworthy pickup truck on the farm, has been replaced by brand new Big Blue. But when it comes time to cart fruits and vegetables to the farmer's market, the gentle Little Green will have his time to shine. 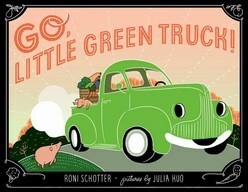 An artfully illustrated truck book for farmers-market shoppers and their little ones.